Our first meeting of the 2018 Autumn season brought us Bobbie Miller, Director of Quarry Arts, to deliver a talk entitled "Quarries: Arts and Heritage", an illustrated talk about some of the Quarry Arts projects, including Musical Rocks and Quarry Tales. Quarry Arts (originally called Yorkshire Quarry Arts) is an organisation set up in 2003 by Leeds University to engage with communities for creative and performing arts inspired by quarries. Bobbie has been with Quarry Arts since the beginning and having retired from Leeds University in 2011 continues to be a leading figure in all their projects. She began her talk by explaining that some rocks "ring" and it is possible to make music from them, something our ancestors were probably doing hundreds if not thousands of years ago. She then showed us images of lithophones (a xylophone type instrument made from rocks or stones). The first image was of the instrument made by Peter Crosthwaite in 1785 which is now housed in Keswick Museum. She went on to explain that it was made from stones from Skidaw. This was followed by Joseph Richardson's "Rock and Steel Band", an instrument he played for Queen Victoria on more than one occasion. The evening however turned out to much more then just a talk, as Bobbie had brought with her some examples of rocks, and instruments made from rocks local to the Dales. 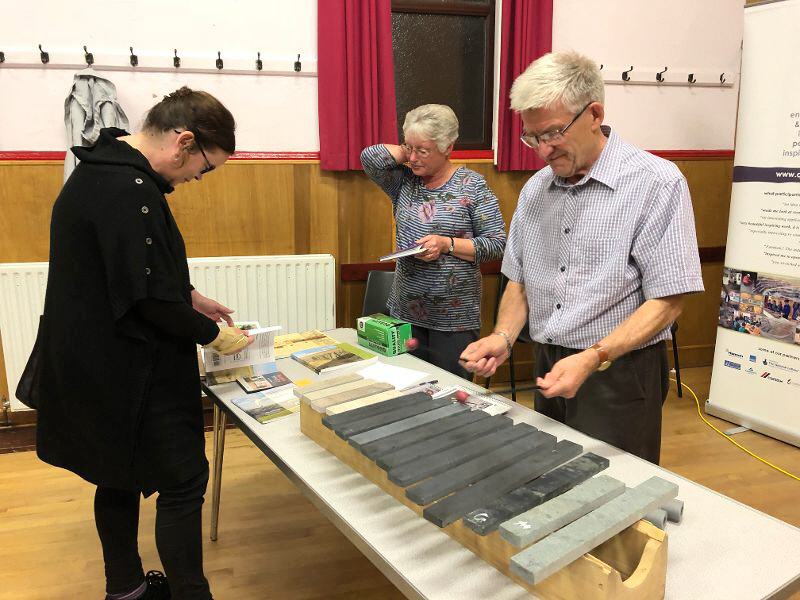 She also accompanied her narrative by demonstrating the sounds, explaining that an ongoing project for Quarry Arts is to make and provide these instruments to various sites in the Dales. She then went on to explain the processes, the expertise and skills which were required to source the correct stone and cut and shape it to achieve the right notes, which the audience found both amazing and fascinating. We were also very interested to hear about the various recordings made using these instruments, particularly by the famous deaf percussionist, Dame Evelyn Glennie who "hears" the music from the vibrations through her body. Bobbie's very obvious enthusiasm for her subject made the whole event thoroughly enjoyable for her audience. We were delighted to hear about the organisation's involvement in local schools. Several Dales schools have been fortunate to have the opportunity to source rocks and prepare them to make their own instruments. What fun the children must have had, and the learning opportunities from such an exercise are immense. So, whilst we were interested in all the projects involving these instruments that Bobbie was describing, the best of the evening was yet to come. Closing her talk by playing some recordings, Bobbie then invited the audience to play the instruments she had brought. Such was the enthusiasm for this that people were queuing up. And it proved to be a thoroughly enjoyable and entertaining experience. A fitting end to a wonderful evening. The next meeting on Monday 29th October 2018 will be an illustrated talk by Micheal Turner - entitled "World War One Pilots and Bramham Moor Airfield" An appropriate subject since we will be approaching the centenary of the ending of WW1. Photo: taken by Bobbie Miller showing society members trying out the stone instruments.